Dashboards are flavor of the month right now, and there is no shortage of suppliers providing dashboard platforms – most of them in the cloud. The pricing of these platforms seems quite random. Some relatively unsophisticated platforms come with a high price tag and glossy marketing. Others are quite sophisticated, with scripting language and good visuals, and a modest price tag. So it pays to shop around, and below is a list of leading BI dashboard platforms. ClicData cloud dashboard platform that is easy to use, but also provides tools for more complex requirements. Simple to very demanding dashboard requirements. Bittle cloud dashboarding platform for simple to moderate complexity dashboards. Chartio cloud dashboard platform. Very easy to use and catering for simple to moderately complex dashboards. Expensive. Cyfe is a widely used cloud dashboard platform for simple to moderate dashboard needs. Dash cloud dashboard platform supports simple dashboards at a very modest price (free account available). DashZen supports the creation of both private and public simple dashboards in the cloud with connections to various online data sources. Free account available. DataHero is a moderately expensive cloud dashboard platform suitable for simple to modest dashboard needs. Domo is an expensive cloud dashboard platform emulating an executive information system. Not really a general purpose platform. Dundas sophisticated dashboard and reporting capabilities with connectors to most data sources. On premises or cloud and more expensive than many others listed here. Grow simple to use cloud dashboarding for simple to moderate needs. Quite expensive. iDashboards Enterprise Suite is suitable for large organizations and cloud deployment is suitable for smaller organizations. Klipfolio cloud dashboard platform with a rich set of data connectors and modest pricing. Simple to moderately demanding dashboard requirements. Netvibes is more geared to social media analytics, but can also be used outside this domain. The free service provides the dashboard and reader. Plecto is targeted more at the sales department and adds gamification. Cloud based, supporting simple to moderately demanding needs. 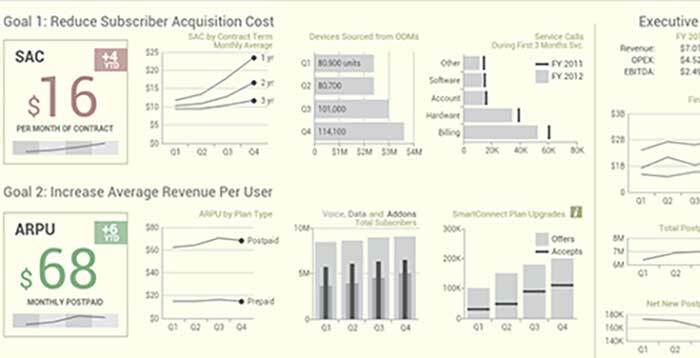 Qlik Sense sophisticated cloud or on premises reporting and dashboarding platform. Suitable for medium to large businesses. Quite expensive. Scoreboard cloud KPI dashboarding. Simple to modest needs and moderately expensive. Slemma cloud BI and dashboard software with intuitive drag-and-drop interface or writing and running SQLs to build charts. Simple to sophisticated needs. Spotfire very sophisticated on premises and cloud dashboard and analysis platform with support for advanced analytics. Simple to very sophisticated dashboard needs. Tableau top end data visualization platform. Probably overkill for most dashboarding needs. Cloud or on premises, and quite expensive. Zoho reports cloud based dashboarding and reporting. Modestly priced but free for up to 2 users.